Star Wars 7: Are Obi-Wan and Yoda in The Force Awakens? J.J. Abrams' Star Wars: Episode VII - The Force Awakens is finally here, and while new characters like Rey, Finn, and Kylo Ren stole the show, seeing the old guard of the original trilogy once more was a major part of the movie's appeal. Han Solo and Chewbacca had the biggest roles to play in the story, but everyone from Luke Skywalker to Admiral Ackbar returned for another go-around, giving The Force Awakens a cross-generational element that's made it a box office behemoth. But it wasn't just the heroes who lived through the Galactic Civil War coming back. A couple of old friends who are one with the Force had cameos as well. As fans settle in to see Episode VII (or go back for a repeat viewing), they'll have one more thing to look forward to: the voices of Jedi Masters Obi-Wan Kenobi and Yoda. “The idea of the voices was, we wanted the audience to feel – but not necessarily be presented right in your face — this idea that familiar, Force-strong voices were connecting with her. At least as well as they could. You do hear a little bit of Yoda. You hear Luke yelling out, ‘Nooo!’ from that moment in Empire. And you hear Obi-Wan at the end say, ‘Rey … these are your first steps.' Here’s the cool part. We asked Ewan McGregor to come in and do the line." 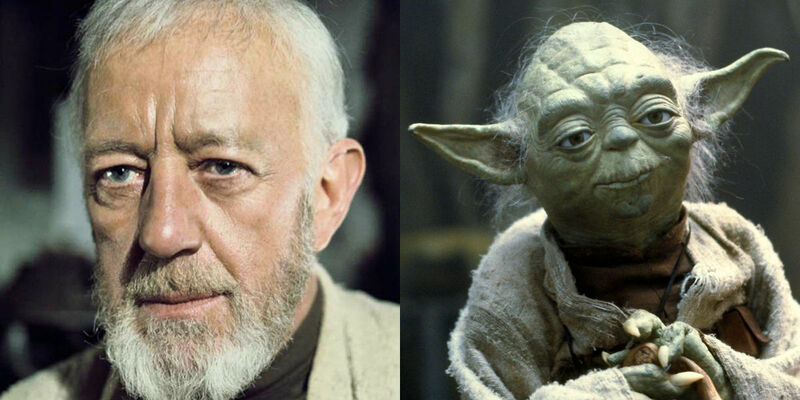 Abrams also revealed that the crew used some clever editing to have the late Alec Guinness reprise his role as the elder Kenobi, taking an instance where the actor said "afraid" and turning it to "Rey..." This is a smart and subtle way of illustrating Rey's strong connection with the Force. Having Obi-Wan and Yoda appear as Force ghosts to nudge her on would have been illogical, but Rey hearing their voices makes sense. A powerful Force user can read objects to gain insight on past and future events, and since the lightsaber belonged to Luke, it's understandable that his former teachers (with whom Luke had many experiences) would reach out to Rey in a way that fit the story. “Everyone who has seen these movies thinks about ‘I am your father …’ and ‘There is another …’ But neither of those things were in [1977’s original] Star Wars. Star Wars didn’t say Luke was the son of Vader. Star Wars didn’t say Leia was the sister of Luke. You didn’t understand what these references were: the Empire, dark times, Clone Wars. There were these things that were discussed that don’t get explained." This is something that's easy to forget. Audiences today can watch the complete classic trilogy in full without being teased by dangling narrative threads being left for future installments. It's arguably a good thing that Abrams didn't reveal too much in his film, because now there's still so much left to discover and explore. Rey, like Luke before her, has just taken her first steps into a larger world. As time goes on, she (and the audience going along with her) will learn more about where she came from and what her ultimate destiny will be. Star Wars: Episode VII – The Force Awakens is now in theaters, followed by Rogue One: A Star Wars Story on December 16th, 2016, Star Wars: Episode VIII on May 26th, 2017, and the Han Solo Star Wars Anthology film on May 25th, 2018. Star Wars: Episode IX is expected to reach theaters in 2019, followed by the third Star Wars Anthology film in 2020.